Why waste time learning how to play songs?" Thanks to the 3G iPhone's mobile web browsing capabilities, you may never need to learn how to play a song again. If you've managed to elbow your way through the queues and get hold of one of the new iPhones then you'll doubtless be aware of the numerous applications available for music making. 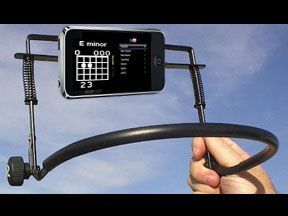 However, with the internet providing the largest (often illegal) library of guitar chords, tab and song lyrics imaginable, what guitar-playing iPhone owners need is some sort of hands-free kit allowing them to play along while following onscreen notation. While it's not in production yet, we think Brian Kane's whimsical notion of a harmonica-style neck rack for the iPhone could be a genuine winner and a busker's dream. You may never have to turn down a request again. As Brian himself says, "Practice anywhere; get laid quicker." If Brian wants to send us a prototype, we'll gladly test out the theory.